We Only Want The Earth: Emigrate Or Flip Burgers! “Emigrate or work in a fast food outlet.” That is the extraordinary threat made to graduate nurses by Minister for Health, Dr James Reilly. It is aimed at those who do not wish to accept the slave wages on offer under the new graduate nurse recruitment scheme. The scheme, which intends to recruit 1000 nursing graduates on 80% of the standard minimum pay, has been widely condemned by opposition politicians and nursing unions. There are some who claim that the government is creating 1000 new jobs and that this is to be celebrated. However, the government’s plan is to save €10 million by cutting out agency nurses and no jobs will be created as agency nurses lose their positions to be replaced by cheaper graduate nurses. The ‘scheme’ or more appropriate ‘scam’, will see new graduate nurses taking a 20% or €5442 pay cut. This is on top of cumulative pay cuts of 24% in recent years. Taking into account that a graduate nurse’s starting salary is €3,000 more in the UK, and €10,000 more in Australia, I think many will see the emigration option of Dr Reilly’s threat as very appealing. 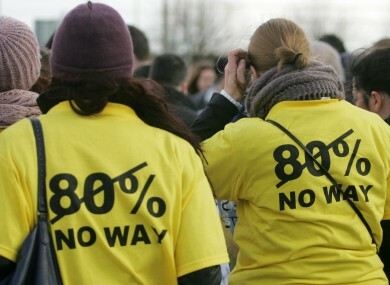 The Irish Nurses & Midwives Organisation is to be commended for its call for a boycott of the scam which has seen a paltry uptake of approximately 60 so far, leading the HSE to extend the deadline for applicants indefinitely and include eligibility for 2010 and 2011 graduates. In contrast, the Union of Students in Ireland and DCU Students’ Union have issued no official statements in support of graduate nurses. It is unacceptable that an issue that affects around 1,000 DCUSU members is not being fought for by our Student Union. This government scam raises broader issues for all of Irish society. That is the chronic undervaluing of care work. This is illustrated by the government cuts to respite care grants and carers allowance in recent times. It’s no surprise that both nursing and care work are commonly seen as women’s work and are on the lower ends of the pay scale. In a country where in the 21st century, a woman still does not have the right to choose what to do with her own body, earns 73% of the average man’s income and whose own constitution states that a women’s place is in the home, this is as much a gender equality issue as a fair-pay issue. Again the working class are being asked to suffer the burden of the banking crisis. Again it is mostly women who will suffer hardest. Dr James Reilly shows total disregard for the profession of nursing when he equates it with flipping burgers. Some might say that this is typical in misogynistic, sexist Ireland. Without doubt, it is typical of Dr Reilly’s opinion of the working class. It’s time to stand up for those who should be the most valued in our society. These people work tirelessly to nurse our loved ones back to health. Shame on you Dr Reilly. Shame on this government. 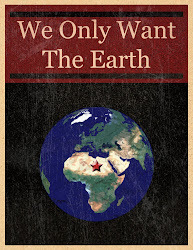 We Only Want The Earth.